Good morning everyone! So glad you joined me today! 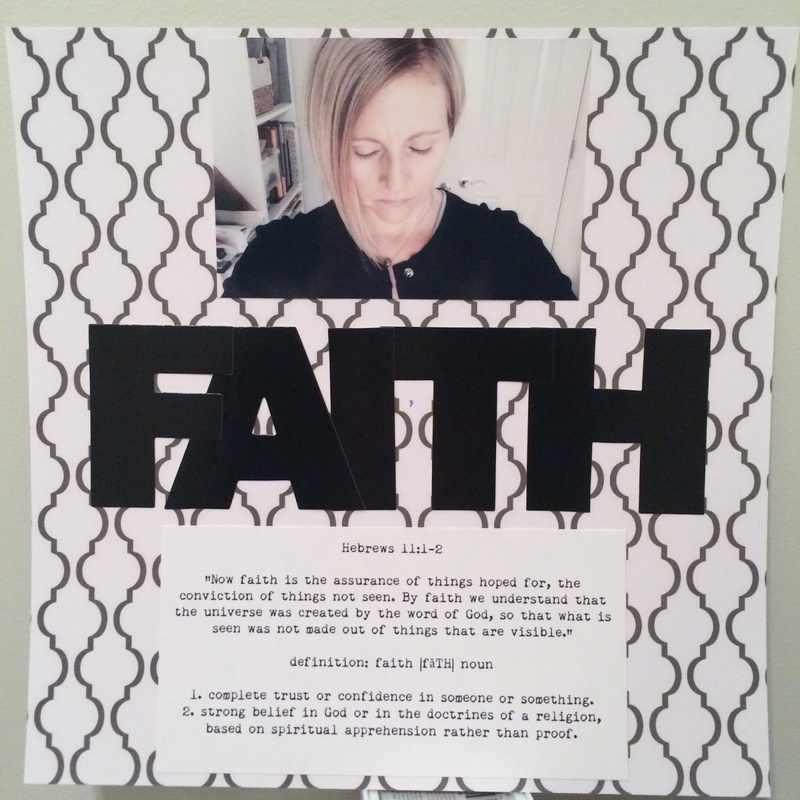 Today I am sharing with you a page I made about my faith. I am very rooted in the word of God and have a very strong faith, but I always am humbled by how very much I have to learn. Here is God's definition of faith from Hebrews, and the world's definition from the dictionary. Somewhat similar aren't they? I love how this verse says so much in so little. It is the assurance of things hoped for but not seen. God created the universe with His word. Out of nothing he created something. Which to me describes the awesome power of God. If he can do that, I can't even fathom what he can do in my life. The dictionary definition is telling in that it says complete trust, not trust when its convenient or when it suits me, complete trust. So in ALL things trust in the Lord. If God can move (or create) mountains, I think God can handle all my problems. I also think it's interesting to note the second definition that says it is based on spiritual apprehension rather than proof because I have seen "proof" of God a number of times in my life. I have seen miracles happen. I have seen things happen that are unexplainable, in life and in people. Where the world says coincidence or luck, I say God. So moving on to details of the layout, the base paper is Heidi Swapp color magic. If you haven't been able to tell, I am trying to use up all of my stash (because I have WAY too much stuff) and have been dipping into it a lot lately. YAY! The large black letters are from a Studio Calico kit from last year. And that's the gist of the page. Pretty simple but beautiful. Thanks for joining me and have an awesome day!